If you’re an iPad owner, into strategy games, and are a history buff, the mere mention of Slitherine’s name is probably enough to get your blood pumping. 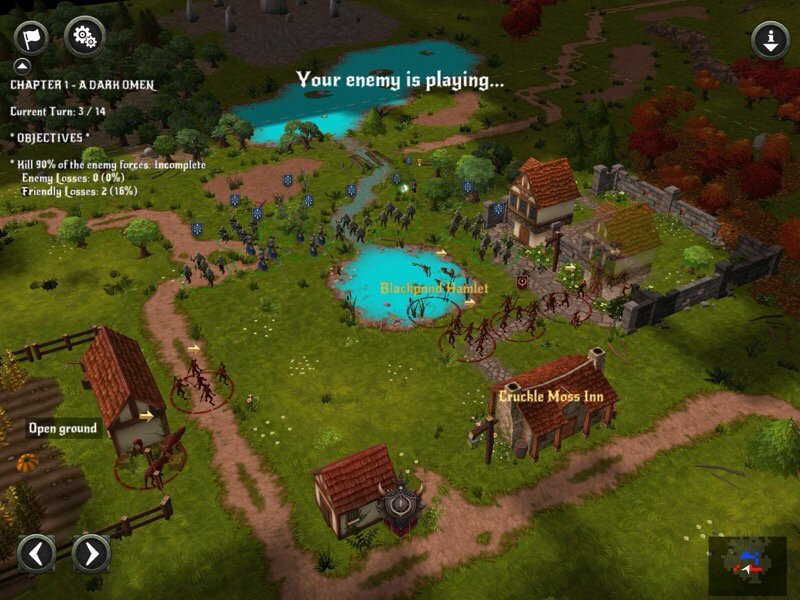 Simply put, they consistently release some of the finest strategy games on iOS. Their games tend to be on the upper end of the App Store price range, but it’s a genuine case of getting what you pay for. Each game is typically packed with content, extremely well-designed, and rounded out with a full set of features. Another well-known name in iOS strategy circles is Hunted Cow Studios, who are also nothing if not reliable. For years, their niche was in regularly releasing low-priced games covering a variety of interesting settings. The mechanics of those games rarely held any surprises, but they filled the belly without emptying the wallet. These two major forces in the iOS strategy game scene have come together with the release of Hell: Fight For Gilrand ($9.99), an iPad-only release. Not long ago, I would have called this an odd team-up. Of course, both companies are in the same branch of gaming, but they seemed to have very different philosophies. Recently, however, Slitherine seems to be eager to make more extensive use of their assets, and Hunted Cow appears to have changed up their tactics of late, slowing down somewhat from their usual hectic release schedule. Whether they’re simply giving a high-five as they pass by each other or planning on working together more in the future, at the very least, the gamers get something nice out of the deal. Hell: Fight For Gilrand uses Slitherine’s awesome Battle Academy ($19.99) engine, seen recently in the lovely Pike And Shot ($19.99), so you can expect a certain degree of quality right from the go. It’s content-rich and and fully-featured the way previous games using this engine have been, with two hefty campaigns, a skirmish mode, and multiplayer of both the hot-seat and asynchronous online sort. In a very unusual turn for Slitherine, and only slightly less so for Hunted Cow, Hell: Fight For Gilrand has no aim towards recreating history, instead opting for a cheeky fantasy setting that has a bit of a Bullfrog aroma to it. That might be a turn-off for some, but personally, I feel like certain historical settings have been overdone nearly as much as fantasy if not more so. I see another game based on the American Civil War and I can’t help but feel a certain apathy. It’s nice to see developers venturing into new territory for them, even if it’s not exactly fresh in general. They have a lot of fun with the concept, too. One side of the conflict is your typical fantasy kingdom, complete with mages and gryphon-riding knights, while the other represents the forces of hell itself, replacing foot soldiers and archers with imps and demons. Both sides are played for laughs, to an extent, with the heroic side seeming more than a little bumbling and the demonic side coming off as blowhards. You get a chance to play as both of them, with the first ten missions of the campaign dedicated to the Order Of Radiance and the remaining ten featuring the hellspawn. You can play the maps in any order you like, though they are ordered according to difficulty, so you will probably want to start from the beginning and work your way up. 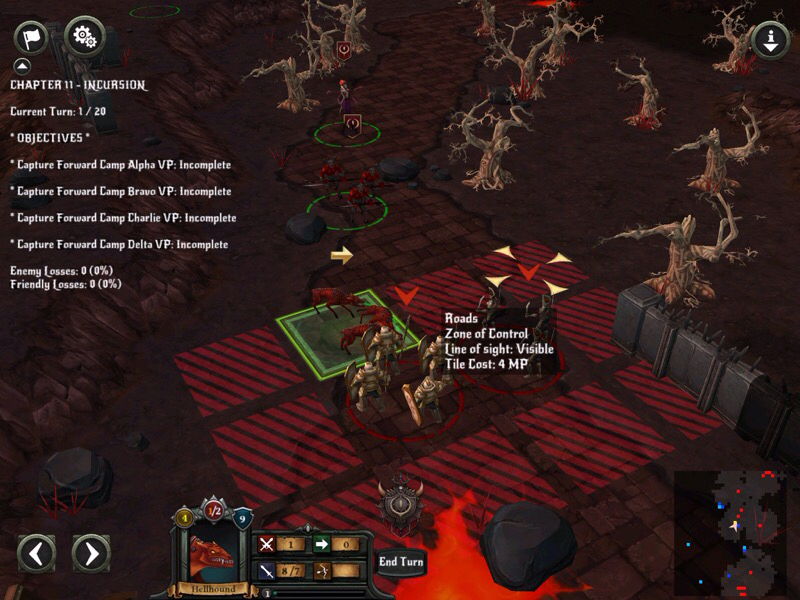 As usual for Hunted Cow games, there’s also a short tutorial campaign to show you the ropes. It doesn’t quite explain everything, but it’s enough to get you going. The maps have various goals, some focusing on securing certain points or holding them, while others are more straightforward slaughters. The way most of the missions are balanced, the bulk of your forces are usually melee attackers, with only a handful of precious ranged fighters. With a major focus on melee, positioning becomes the key to overcoming your enemies. Units will receive support from other friendly units depending on how they’re arranged on the battlefield, and owning control of the immediate territory is of vital importance. If you’ve played Battle Academy before, you’ll find a lot of familiar elements here. You need to be careful not to be surrounded, you have to mind the morale of your units, and so on. In spite of the very different theme, Hell is a lot closer to Battle Academy than Pike And Shot was. It’s perhaps a little too close at times, but it’s not as though this particular well has been tapped out yet. It’s interesting, and perhaps a bit unfortunate, that Hunted Cow has run into this kind of situation again. One of the biggest criticisms I see levied against them is how similar their titles tend to be to one another, and now they’ve adopted a whole new engine and are starting to brush up against the same circumstances. I’m impressed with the amount of content in Hell, though. The missions are all fairly lengthy thanks to the size of the maps. You can play each of them on three different difficulty settings, all of which provide a reasonable challenge, even on the lowest level. The game doesn’t give you a lot of wiggle room for wasting units or moves, so you’ll have to play well if you want to succeed. The computer is fairly clever and will do what it takes to control territory and split your units when it can, and the overall size of the maps means you will usually have to keep your eyes on the big picture. After finishing the campaign, you can look forward to a skirmish mode with extensive customization options, and the real star of the show, the multiplayer. If you can find well-matched opponents to play Hell with, it offers almost limitless replay value. That’s more on the strength of the Battle Academy set-up than anything Hell is doing in particular, but it’s still a big positive for the game. Given the engine it’s using, you can probably fill in several blanks on Hell‘s presentation on your own. Gorgeous 3D graphics that you can zoom in and out on at any time, nice animations, and a good variety of background details and character models. The cost of that, as ever, is a game that runs a bit choppy on all but the newest hardware. One useful tip is to go into the options and turn off the shadows. I found the game’s speed picked up nicely after doing that. Each mission only gets a little bit of story context, and there isn’t much of an overarching plot to keep track of, so it works well if you’re the sort that can only get to a mission here and there. The controls are much the same as in Slitherine’s other releases using this engine. Nothing too difficult to remember, and icons are usually accompanied by an explanation of some sort. Interestingly, Hell: Fight For Gilrand sells at a much lower price than the other games using the Battle Academy engine. As a result, if you’re looking to try one of these games out and don’t mind the fantastical setting, this is the obvious choice. If you gobbled up Battle Academy, its sequel, and Pike And Shot, you’ll find another excellent serving here. I think this game also offers a strong experience for strategy fans who love the serious designs of Slitherine titles but are looking for something a little less serious thematically from their usual fare. Those who burnt out on previous titles using this engine might want to avoid Hell: Fight For Gilrand, however. The window dressing might be different, but mechanically this doesn’t venture far from the blueprint, however excellent said blueprint may be.